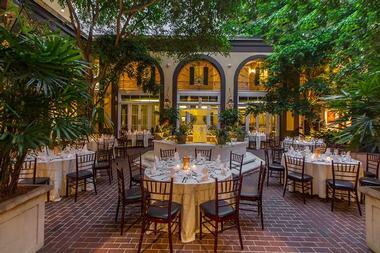 The Hotel Mazarin is a luxury boutique hotel in the heart of New Orleans’ vibrant French Quarter. 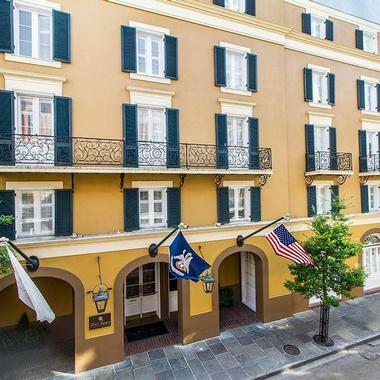 Located just a block away from the famous Bourbon and Royal Streets, Hotel Mazarin features 102 beautifully appointed and charmingly decorated guest rooms and suites set around an elegant courtyard with a magnificent fountain as its centerpiece. In addition to luxurious accommodations, the hotel features Patrick’s Bar Vin, a classic French Quarter wine bar with a casual ambiance, a 24-hour fitness and fully equipped business center, a charming courtyard with a Renaissance-inspired fountain, and access to event and catering venues at the nearby La Louisiane. The Hotel Mazarin features 102 beautifully appointed and charmingly decorated guest rooms and suites set around an elegant courtyard and fountain. Guest rooms and suites feature country-style décor and period furnishings, plush pillow-top king or queen-size beds with deluxe linens, and well-appointed en-suite bathrooms with separate vanity areas, walk-in showers, and organic bath products. Modern amenities include cotton bathrobes and slippers, coffee makers, alarm clock with iPod/iPhone docking stations, high-speed data ports, local calls and voicemail services, complimentary wireless Internet, and bottled water. Petit King Rooms are cozy and neat with plush pillow-top king-size beds, en-suite bathrooms with walk-in showers and separate vanity areas, and views of the hotel’s private courtyard and Renaissance-inspired fountain. Deluxe King Rooms feature plush pillow-top king-size beds, en-suite bathrooms with walk-in showers and separate vanity areas, and limited views, while Superior King Rooms have pillow-top king-size beds, en-suite bathrooms with walk-in showers and separate vanity areas, and beautiful French Quarter or courtyard views. Superior Queen/Queen Rooms feature two plush pillow-top queen beds, en-suite bathrooms with walk-in showers and separate vanity areas, and gorgeous French Quarter or courtyard views, while Premium King Rooms have plush pillow-top king beds, en-suite bathrooms with walk-in showers and separate vanity areas, and private balconies with lovely views. 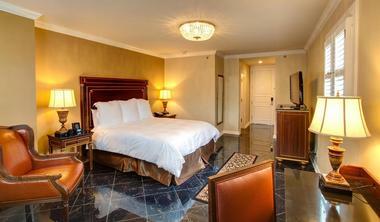 Luxury Petit Suites are 400 square feet in size and located on the third floor of the hotel. The deluxe suites feature charming bedrooms with plush pillow-top king-size beds, en-suite bathrooms with walk-in showers, separate vanity areas, and organic bath products, and private sitting areas with flat screen televisions, wet bars and coffee makers. The opulent Presidential Suite is 878 square feet in size and features a spacious, thoughtfully decorated living room with double door mirrored armoire, faux fireplace, and flat screen television. A fully equipped kitchenette has a breakfast bar with two stools and has full refrigerator and freezer, microwave, an ice maker, dishwasher, and Keurig coffee maker. The bedroom has a plush pillow-top king-size bed, and an en-suite bathroom with a double vanity and walk-in shower and a spacious balcony features a wrought iron table and chairs and boasts beautiful views over Bienville Street. 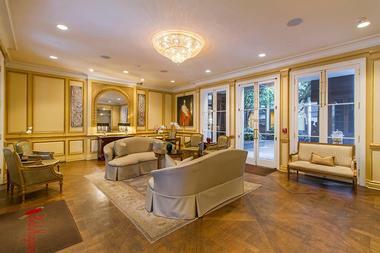 The ultra-luxurious Fleur de Lis Suite is the crown jewel of Hotel Mazarin at 1,030 square feet. Located on the second floor, this elegantly styled French Quarter suite features a spacious bedroom with a plush pillow-top king-size bed and an en-suite bathroom with a double vanity and walk-in shower. Two separate living/seating areas feature a rustic wood dining table for six, comfortable sofas, a faux fireplace, and beautiful crystal chandeliers. A fully equipped kitchen has a pantry, a full refrigerator and freezer, microwave, an ice maker, dishwasher, a Keurig coffee maker and a breakfast bar with three stools. An oversized balcony with a table and chairs boasts beautiful views over Iberville Street. Hotel Mazarin has an elegant dining room that can seat up to 150 guests and serves a menu of innovative New Orleans cuisine created by Executive Chef, Agnes Bellet. 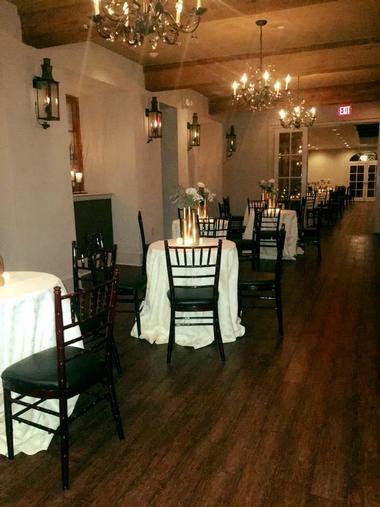 Hotel Mazarin also features chandeliered private dining rooms for a variety of catered functions for groups from 10 to 175 guests, as well as private venues in the nearby La Louisiane Bar and Catering Venue for up to 132 guests. 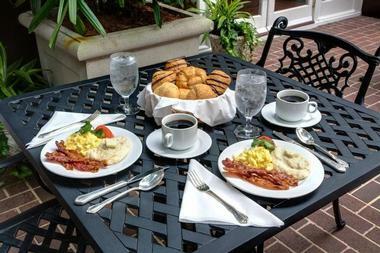 Bespoke services and complimentary amenities at the hotel include a delicious gourmet breakfast served every morning, wireless Internet, local phone calls, bottled water, in-room coffee, and a daily newspaper delivery. Hotel Mazarin offers an array of amenities and services to enhance guests’ stay, including a complimentary gourmet breakfast, served every morning, welcome cocktails at the nearby La Louisiane Bar, a fully equipped fitness center, business center and casual wine bar. Additional services include a 24-hour bell desk, concierge services, daily newspaper delivery, valet parking, and complimentary wireless Internet access. 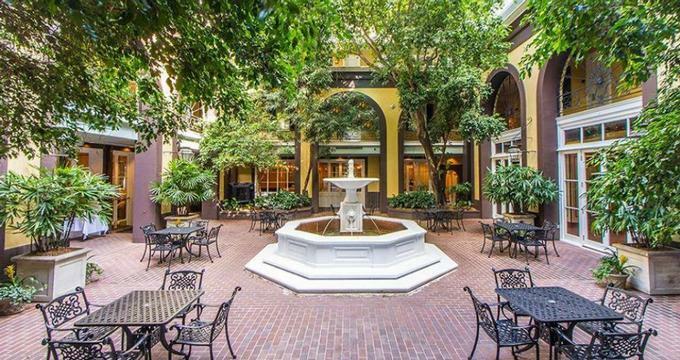 The rooms and suites of the Hotel Mazarin are set around a beautiful French Quarter courtyard and fountain, which offers the perfect place to relax. The Hotel Mazarin and its nearby event and catering venue, La Louisiane Bar, present a unique and elegant setting for a variety of special services from intimate dinners for 20 guests to elaborate theme party for 175 guests. An executive boardroom caters for up to 40 delegates, and flexible indoor and outdoor banquet facilities are perfect for weddings, receptions, and other celebrations. Nicknamed the ‘Big Easy,’ New Orleans is known for its vibrant live-music scene, round-the-clock nightlife, and spicy, diverse cuisine reflecting its rich history as a melting pot of African, American and French cultures. Embracing the city’s festive spirit is the Mardi Gras, the world-renowned carnival famous for its rambunctious street parties and costumed parades. The city is packed with attractions, activities and fun things to see and do. New Orleans is the ‘Festival Capital of the World’ and hosts dozens of festivals that celebrate the city’s rich heritage of food, music, and culture, including the world-renowned Mardi Gras, the French Quarter Festival, and the New Orleans Jazz and Heritage Festival.